Cleansing, toning and moisturising must be a part of your daily skin-care routine. Lemon and gram flour work wonders against tanning. Cucumber helps soothe the skin. Tomatoes combat oil to reveal a brighter complexion. There are endless beauty magazines that lure you into cosmetics, but then you are never sure of cosmetics. Left in a state of confusion, natural remedies and practices seem like a last resort. Natural remedies are very effective and can give you glowing and beautiful face. Here’s a natural beauty guide (natural beauty tips for face) for you to bring that glow back on your face. The rule of thumb for flawless glowing facial skin still remains a regular cleansing, toning and moisturising routine. When it comes to cleansing, rose water is the best cleasing agent. Take cotton wool, dab it with rose water and apply it on the face to feel fresh and clean immediately. Cleansing your face twice a day will prevent breakout of pimples. Always make it a point to follow your cleansing routine by toning. Tulsi water is a great nourishing toner and you can use it with a piece of cotton wool. Now, make a mixture of onion juice, multani mitti and honey. Use this as a natural moisturiser to bring back freshness and glow on your face. Use this for achiving a glowing face. Mix lime juice with sweet almond oil and sea salt. Use your fingers or a cotton wool and apply it on your face in a circular motion. This natural scrub will remove dead cells from your face giving a radiant glow. Lime peel also aids in fading scars and pimple marks from face. To treat sunburns, you may apply a mixture of one spoon of besan (Gram Flour) and two tablespoon of curd on your face. Let it dry for half an hour and rinse off with cold water. This face mask is a great aid in making your skin clear, soft and glowing naturally. For sensitive skin, mix curd with this mixture and cleanse the sun tanned skin with the paste. If you want a happy skin, then cucumber is the answer. You may improve your complexion by applying a paste of cucumber mixed with raw milk. It will take 15 minutes for cucumber juice to seep into your skin then wash off with fresh water. It also helps in soothing and softening your skin. Tomatoes are great anti-oxidants. 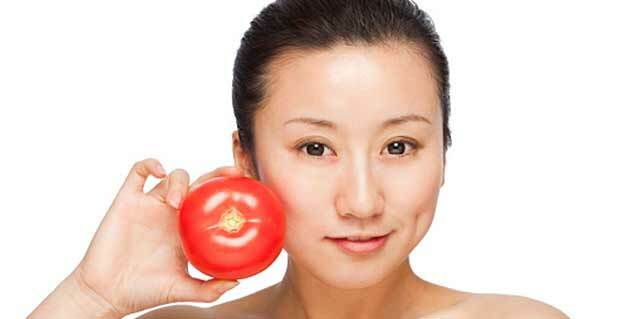 For wrinkle-free skin, mash two large tomatoes and apply it evenly on your face. Rinse off after 20 minutes with cold water. To make a paste, use one day old curd and mix with a tomato pulp. Apply this face pack daily in the morning to reveal a brighter and sparkling fresh complexion for beautiful face. Tomatoes are great for the skin as they have cooling and astringent properties. Its naturally acidic, so it helps balance the skin and get rid of excessive oil. Evenly apply tomato pulp on your face. Let it dry for 15 minutes and wash your face with warm water for naturally glowing face. To naturally remove blackheads and have a fairer skin, prepare a paste with equal amounts of cucumber juice and lemon juice. Apply this paste on your face and neck before taking bath. Let your skin absorb it for at least ten minutes. With regular use you will notice lesser blackheads and a fairer skin tone. If you have dry and rough facial skin, prepare a paste of equal amount of mashed muskmelon, pumpkin, cucumber and watermelon. Blend the mixture with milk cream and apply it on your face. Leave the paste to dry for one hour and rinse it using plain water. It lifts away the dry skin, giving a fresh vibrant look to your skin. Slice an apple into thin slices. Place these on the face and leave for 15 minutes. These soak up the extra oil and helps to close pores. You may even make paste of apple peel, honey, vinegar, and a dash of multani mitti. Apply for 30 minutes and rinse off with rose water. Your skin will visibly tighten and will develop a healthy, radiant glow. Water and good sleep are natural facial beauty enhancers. 10-12 glasses of water per day and six to eight hours of sleep every day is essential for your skin to revitalize and repair damaged tissue. Set reasonable limits, scale back your to-do list and make time to do the things you enjoy. It will help in curing acne breakouts, acne scars and other skin problems. Read more articles Skin Care.